Satellite speakers: Small size, good sound? Just like soundbars, satellite speakers often get frowned upon by the audiophiles and AV enthousiasts. The problem they are referring to is the limited mid and lower range they are typically able to provide because of the small speaker cabinets. But just like soundbars, satellite speakers do have a place in certain homes, depending on your requirements and budget. What’s more, sound quality has improved a lot over the years. And we haven’t even started talking about some of the cool designs out there. The trick is to know what to look out for and you may be very pleasantly surprised about what some of these little satellite speakers are capable of. Satellite speakers typically have the smallest cabinets of any speaker powered by an AV receiver. It is their size that makes them attractive because they offer great flexibility to play many roles in a home theatre, but at the same time, their small size also defines their biggest challenge. The satellite speaker category has a bad rap for poor performance compared to bookshelves or towers. Part of this is a presumption by manufacturers that someone who’s buying satellite speakers doesn’t care as much about sound quality or an immersive audio experience as someone who’s considering bookshelf or tower speakers, so too often they aren’t built with the same attention to detail or specifications. Because of their small size, they tend to struggle in the mid to low ranges. Even with an added subwoofer they don’t always blend well with the subwoofer. The issue is one of the speaker’s lowest frequency response range not matching up with the subwoofer’s upper range. A separate subwoofer, should really not go much higher than 80Hz if it is to remain “hidden” in the room and play those low frequencies without turning heads. A subwoofer is simply not made to play these frequencies. That’s why it is a good idea to if you are going to go down the road of satellite speakers, a 5.1 (or 2.1 or 7.1) package including a subwoofer that is especially designed to work with the satellites can be a good idea. It means that the subwoofer and the satellites are ‘made for each other’ and when done well, will cover the entire range as a team. It is fair to say that satellite speakers come in many different shapes. What probably is of most interest to you is that the sound and build quality can vary greatly from speaker to speaker. How do you differentiate a good satellite speaker (package) from a bad one? Luckily you don’t have to put up with bad sound if you want satellite speakers. Just understanding a few key factors will help you find some great sounding satellite speakers with amazing dynamics and sound quality that also offer tremendous range, looks and flexibility. 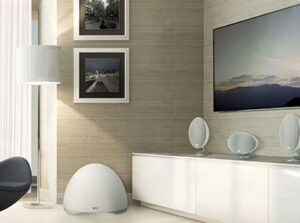 The main attraction of satellite speakers lies in the fact that they are compact and extremely décor friendly. Unlike towers, they are wall and ceiling mountable and on condition that you choose carefully, they can be a big improvement on your laptop speakers, portable speakers, television speakers or even a sound bar. Very often their strength lies in their flexibility and the compromise they offer between improved sound quality and appeal to the eye. They obviously work really well for creating immersive surround sound in small to medium sized rooms, often in a 2.1 or 5.1 arrangement. But don’t get stuck in limited thinking when it comes to satellite speakers. They can also be used as side or rear surround sound speakers in a larger system that uses tower or bookshelf speakers as the mains. And they aren’t just limited to multi-channel use. Satellite speakers also work great as part of a desktop system and pair well with turntables, PCs, gaming consoles and other nearfield listening experiences, especially given their compact stature. As we mentioned before, the key lies in choosing carefully, maybe even more than with a bookshelf or tower speaker. To start with, although weight isn’t everything, a light satellite speaker with flimsy plastic cabinet and cheap paper drivers will definitely not create an impressive immersive experience. Satellite speakers should “feel” heavier than they look and pass the knock test without any unwanted resonances. From a sound quality perspective, they should produce a full, neutral and balanced sound with thrilling dynamics that make you believe the sound is coming from a much bigger speaker. The neutrality should also allow them to seamlessly blend with other speakers as a surround, height effects and/or other home theatre speaker. The best satellite speakers don’t call attention to themselves, but rather become invisible as the listener is immersed in convincing and highly impactful sound. Since their size prohibits satellite speakers from producing truly deep bass, it’s important to listen for a dynamic and detailed mid-range, where 80% of musical content occurs, as well as sparkling high frequencies which let you know it was built with a high-performance tweeter. These days it is possible to find satellite speakers where the enclosures are extremely deceptive and the all-important midrange detail is completely intact. As we explained earlier, midrange is what typically suffers on satellite speakers, along with mid-bass. New techniques in porting speakers and utilizing the properties of concentric and other 2-way systems is leading to greater output and a more linear frequency response. Satellite speakers don’t have enough dynamic range to be considered full-range speakers. Although they can be used by themselves and provide a very satisfactory listening experience depending on how you want to use them, satellite speakers sound their best when supported by a powered subwoofer. The added bass muscle allows satellite speakers to emphasize the mid- and high-range frequencies, which they are much better equipped to handle. When paired with a subwoofer, satellite speakers in a 2.1 or 5.1 set-up can be part of an amazingly detailed, inexpensive and room-friendly home theatre and/or music system. If you don’t have the ability to add a subwoofer, you may consider moving up to full-range bookshelf or tower speakers, which have more bass output and cope better without the help from a subwoofer. Based on your feedback, most people appreciate our recommendations. We listed our favourite 5.1 satellite speaker packages that prove that satellite speakers don’t necessarily mean poor performance. Although these are ‘packages’, some of the brands also offer the option of separate speaker purchase. Also, note that the options don’t stop with these packages or brands. We have many more options for all budgets under our Home theatre speaker packages section. You can certainly see and feel every penny of that price tag in the system’s gorgeous design and substantial build quality of this 5.1 satellite package. Compact it may be, but nothing about the Def Tech’s presentation is small. We love the full-bodied sound they produce. Some compact systems are all bass and treble with scant regard for the mids, but the ProCinema 600 fills in the gaps with its impressive lower midrange response and watertight integration between the sats and sub. This sub-$2k system effortlessly provides a highly coherent surround field in a small room without degrading the sound quality and that’s pretty awesome for such small speakers. The SVS Prime satellites may not look as fancy as some of the other satellites listed here, but if your budget doesn’t quite reach as far and authoritative full-range sound is you priority in your search for a 5.1 home theatre speaker system that delivers with seamless sub/sat blending, SVS’s Prime Satellite 5.1 is about as good as it gets. Kef E305: The Egg is back! The KEF E305’s stylish, innovative design, polished sound quality and sub-$2,000 tag make it a solid purchase. Sonically, its key talent is its ability to create a seamless, immersive soundstage, in which the speakers meld into each other naturally and integrate invisibly with the superb subwoofer. It also reproduces detail with sparkling clarity and has a relaxed tone that works well with both music and movies. Many people considering a compact, lifestyle-friendly speaker system end up settling for a sound bar because its form factor requires a “path of least resistance” towards what they think is a great audio experience. The reality is, high performance 5.1 or 2.1 satellite systems can be had for the same price as a quality sound bar yet offer a much wider variety of options for further expansion in the future and potentially offer a better surround sound experience as well. All without taking over the room physically. Our advise: consider the pro’s and cons of each option before you jump. Source: Cnet, Best Reviews, AVSforum, Audiogurus, SVS, Klipsch, Definitive Technology, Kef. Photo credit to Kef.